This new 3-DVD MP3 set contains all the lectures, conversations and music CDs ever released of His Divine Grace A.C. Bhaktivedanta Swami Prabhupada, the Founder-Acarya of the International Society for Krishna Consciousnes (ISKCON), plus some additional bonus materials that has never been released. For the 1st time on MP3 DVD-9 audio Archives of Srila Prabhupada! 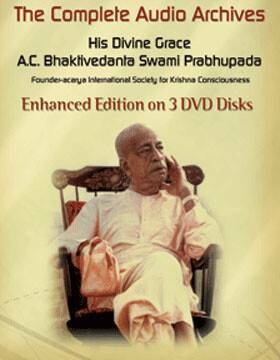 This 3-DVD MP3 set contains all the lectures, conversations and music CDs ever released of His Divine Grace A.C. Bhaktivedanta Swami Prabhupada, the Founder-Acarya of the International Society for Krishna Consciousnes (ISKCON), plus some additional bonus materials that has never been released. 3 MP3 DVD-9s containing over 1,200 hours of Srila Prabhupada's lectures, classes, morning walks, room conversations, and discussions and more than 100 hours of bhajans in MP3 Format. The entire music collections featuring more than 40 Music CDs of Srila Prabhupada including never release bhajans. Full ID3 File Information: For easy playing access, all folders come with content listing as PDF file. Simply click on the desired title and the desired audio will start playing.